Blurb: The first new Circle of Dust album in 18 years, this album not only marks the return of one of the industrial/metal genre’s most underappreciated entities, but sets a new benchmark for the genre as a whole. The early ‘90s was a time rife with creativity as a burgeoning group of artists started to take advantage of the latest advances in technology. One such artist was to eventually become known as Klayton, a self-proclaimed jack-of-all/master-of-none whose then rudimentary skills as a musician and producer would evolve to such a degree that he is one of today’s most revered and accomplished musical entities. However, back in the ‘90s, he was still a relatively unknown figure signed to a label whose support for his activities was less-than-adequate to his creative vision; with his band Circle of Dust, he would craft a small but significant catalog of albums that showcased a vicious and violent brand of industrialized metal that despite the turmoil he faced would earn him a sizable following. After laying Circle of Dust to rest toward the end of the decade, he took his music and production to the next level as Celldweller, establishing his FiXT imprint, and finally taking control of his artistic destiny; yet, even amid his subsequent successes in blending alternative rock and edgy electronic with a cinematic scope, many longtime fans would continue to wonder if they would ever hear any indication of the distorted rumblings of Klayton’s industrial/metal past. In 2015, with the release of Celldweller’s End of an Empire, we received our answer with the Circle of Dust remix of “Jericho,” along with the Scandroid track “Pro-bots and Robophobes,” featuring Circle of Dust. Not long after that, Klayton made the official announcement that after years of legal tangles, he’d reacquired the rights to Circle of Dust, and began rereleasing the albums – including the Argyle Park side project – in specially remastered editions whose deluxe packages also included unreleased demos and alternate mixes never heard before, making for an extensive and ultimately complete document of Klayton’s musical protoform. But that would prove to not be enough to sate either audiences or the artist himself, with the deluxe packages including all new material that hinted at what was perhaps inevitable: a release of brand new Circle of Dust material. At the end of 2016, Machines of Our Disgrace was released, containing 13 tracks of blistering, seething, cybernetically enhanced industrial/metal the likes of which only Klayton could create, containing all the virulent energy and aggression that defined the project but with the modern production sheen that was never afforded the band until now. A pummeling of electronic kicks and a haze of mechanical ambience underscores a distorted scream on “Re-engage,” finally thrusting headlong into the thrashing riffs and scathing biomechanical fury of the album’s title track, Klayton discarding the shackles of Circle of Dust’s troubled past and calling on the listener to look at a world dominated by a diseased machine. Whether that machine is corporate, technological, political, or biological is up to the listener to determine, Klayton’s shrill screams giving voice to humanity’s rage and fears marvelously. The same can be said of the following track, “Contagion,” as the mesh of vocoder effects, forceful riffs and rhythms, and well integrated samples feels like the quintessential classic Circle of Dust song. From start to finish, Machines of Our Disgrace has its sights set firmly on the jugular, teeth clenched in blood curdling ferocity and never once relinquishing its grasp as tracks like “alt_Human,” “Humanarchy,” and “Neurachem” blast through the speakers with the same complex arrangements and cybernetic power that defined past albums like Brainchild and the self-titled debut, while “Embracing Entropy” and “Neophyte” seamlessly integrate dance floor ready beats, harmonious vocal layers, and rapid fire sequences simply too striking to ignore. “Hive Mind” could be an anthem for Star Trek’s Borg species with its lamenting the loss of individuality in favor of the control of the collective mentality, its steely, shuffling rhythms and synths reminding this writer of a track like “Blindeye” from the last Circle of Dust album, Disengage. Never one devoid of moments of introspection, Klayton flexes his melodic muscle on “Outside In,” its slow buildup of marching rhythms and emotive vocals bearing a slight resemblance to “Jericho” from End of an Empire, while instrumentals like “k_OS,” which cleverly recycles melodic phrases from “Embracing Entropy,” and the closing “Malacandra,” its cinematic soundscape of resonant and overdriven synths amid pulsating sequences and strumming acoustic guitars evoking a perilous and decayed wasteland akin to similar tracks on the past albums, particularly those found on Disengage. Such stylistic and thematic callbacks help to reinforce a sense of continuity between Circle of Dust albums, disregarding the near two-decade long gap between releases and signify the project’s undeterred artistic goals and identity. One would be hard pressed to find much at fault with Machines of Our Disgrace as it not only successfully resurrects one of underground music’s most exciting and underappreciated entities, firmly grounding itself in the evolved compositional and production sensibilities of the present day while still adhering to the foundations of the project’s past, but also raises the bar for the genre of industrial/metal in a manner that only a perfectionist like Klayton can achieve. This album is as heavy in its tone and its subject matter as any in its field, and while humanity’s self-inflicted subjugation by an overwhelming and mechanized adversary is not a new or unheard of theme, it remains a compelling one nonetheless, and one that Klayton approaches with a fervor and vitality that most young upstarts can only attempt to measure up to. 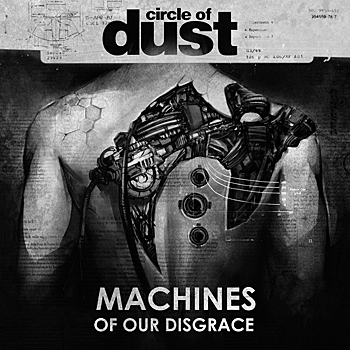 Whether you are a fan of Klayton or the industrial/metal genre as a whole, Machines of Our Disgrace is unyielding in its complexity and its intensity; rejoice and reengage… Circle of Dust is back!